i have run this question else where and thought i would ask here as well. there is just so much crap to learn that i think i am loosing my mind. Issues of your mental health aside, yes it sounds plausible. You could cut the entire front off the carrier, essentially flat faced like the FAL. Install a bushing in the gastube and set it up with a return spring. yep exactly how my warped mind pictured it!!! Your putting way too much thought into this. The EOD carrier weight is almost perfect for a standard AK 47 recoil assembly on a full sized receivered AK. I based my carrier off of it, but with a few changes so it would work with the 9mm round and I also timed it not to fire out of battery. You need to make a stop plate on the recoil assembly or use a buffer to keep the carrier from jumping the rails though. 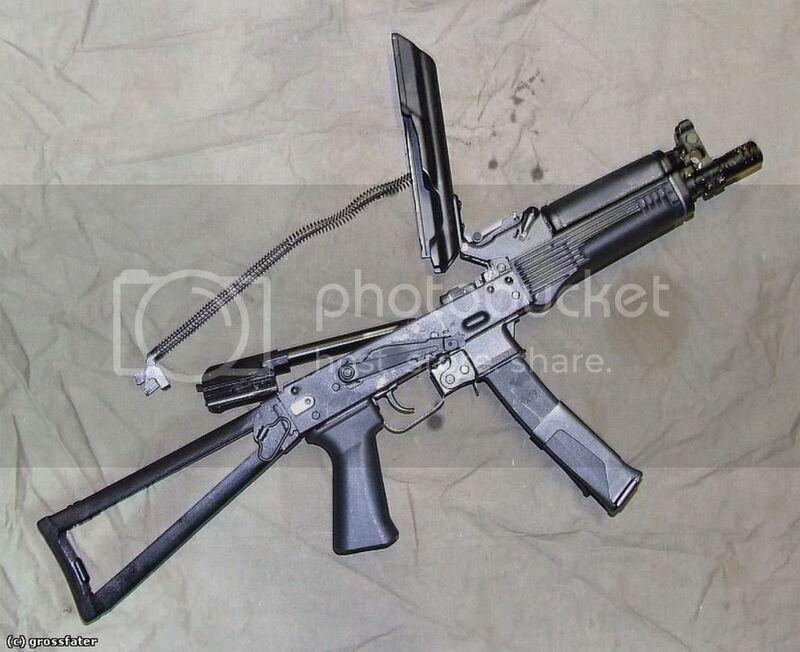 Look at the Vityaz recoil assembly in this pic. P.S. No I don't have all measurements at this time as per the Saiga 12 question. agreed as it pertains to a blowback setup. i am referring to a gas operated system. the eod is a great solution, but i was trying to work within the limits of what i have on hand. and i will have to say thats one hot rifle. Yes I like that rifle myself. Can't wait to finish mine. Be sure to post some details. I am still on the fence between blowback and gas op. That Vityaz is freaking awesome. Somewhere down my list of builds I want to do, is a clone of that. I have a similar type weapon with my gas op x25 build, and I might do a visual conversion on it, and SBR it. It looks too good with a folder not to SBR it. Scott, if you start building this gas op 9mm as you proposed, please document it well with pics, as this sounds very interesting. BTW, did you mean PKM, as the RPK is the same as a standard AK? Any new info on them bolts you were going to have made? I'm working on a shorter receiver. The Vityaz is 11/16 shorter than a standard receiver. I HAVE AN RPK BCG/TRUNNION AND SPRING. THE SPRING I SENT YOU IS TYPICAL OF WHAT I NORMALLY SEE, A SPRING WITH 2 U SHAPED WIRES INSIDE. HOWEVER, THE RPK SPRING I HAVE HAS A SOLID ROD RUNNING HALF THE LENGTH. I LOOKS AS IF THE ROD FITS JUST AFT OF THE CARRIER WHEN ASSEMBLED.